View of the area around Mt Kynthos, the sacred mountain of Delos. A contested crossroads of culture, commerce and fluctuating fortunes. Ancient Delos seems never to have escaped its geographical destiny as a cultural and commercial crossroads frequently caught up in regional or imperial conflicts. 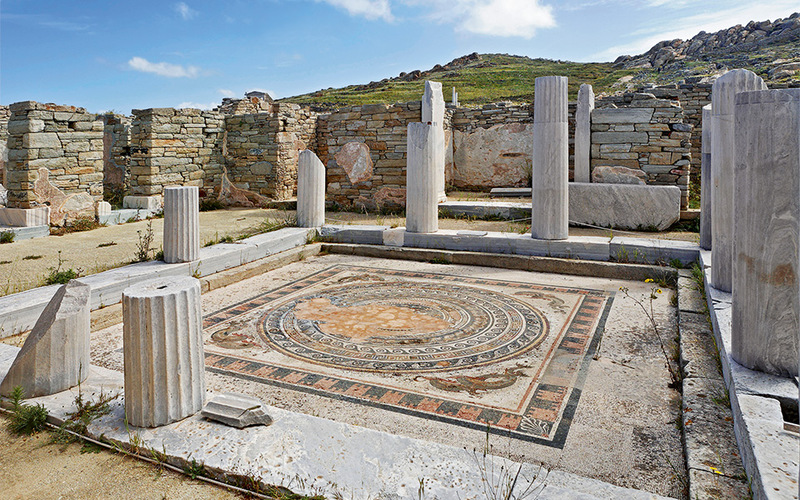 Centrally located amid the Cycladic Islands of the Aegean Sea, Delos (the “Visible” island) was long a place of worship, unity, contention and bloodshed. Birth and death were major issues for Delian residents, as the island was believed to be the birthplace of the god Apollo and his sibling Artemis. Yet mortal childbirth was prohibited on its sacred soil. Pregnant women had to depart to the neighboring island of Rineia before their time of delivery. 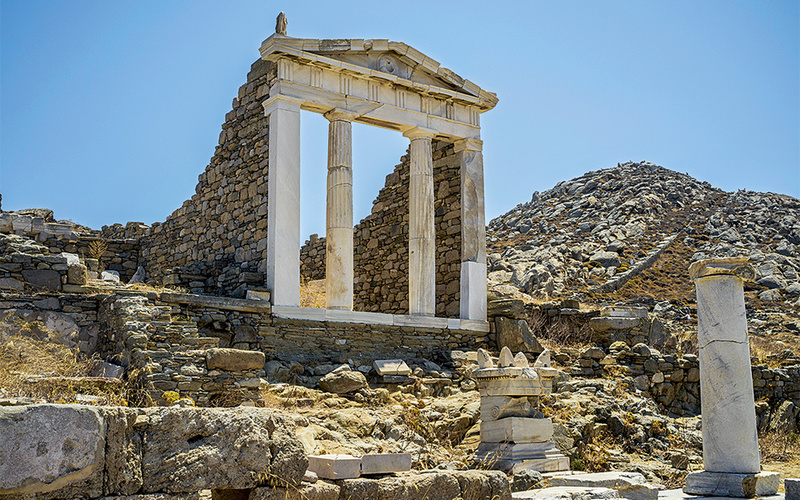 Ancient life on Delos was vital some two to three thousand years ago – characterized by rituals, festivals, theatrical productions, athletic games and high living in affluent, mosaic-paved houses with colonnaded courtyards. It was also marked, however, by hard labor for the lesser citizens and imported slaves, who performed myriad menial tasks in shops, temples and workshops, loaded and unloaded goods in the busy ports and generally made the wheels of daily Delian existence turn. Over its history, Delos witnessed power struggles, repeated invasions and notoriously bloody attacks, as the vulnerable island’s widespread religious, political and commercial reputation often attracted to its shores covetous would-be possessors or marauding pirates from every cardinal point. 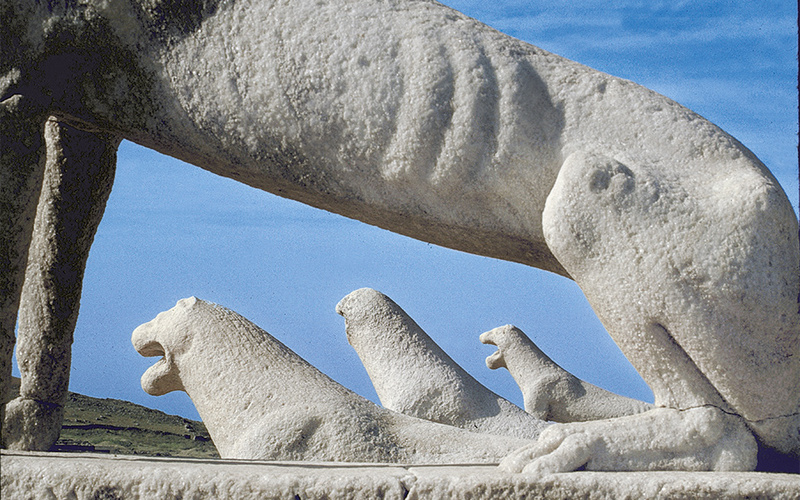 The original Naxian marble lions (late 7th c. BC) were erected as dedicatory offerings to Apollo and Artemis and can be seen today in the Delos Museum. Their replicas still stand guard near the Sacred Lake. Nowadays, the ruin-strewn islet of Delos is still something of a crossroads, occupied for a few hours each day by multi-national hosts of adventure-seeking tourists. Its sprawling urban landscape represents an extraordinary outdoor museum and one of Greece’s most important archaeological sites. No more the regional power base, Delos now has an enchanting, sometimes eerie tranquility that starkly contrasts with boisterous, all-night Mykonos. Researchers can stay longer on the island, but even their inquisitive presence does little to alter the sense of quietude and abandonment that long ago descended on this seaborne ghost town. Since 1873, the French School at Athens, in collaboration with the Greek government, has excavated large areas of the island’s port city. Amid the maze-like pattern of deserted dwellings and shops, hundreds, perhaps thousands, of doorways offer glimpses into a past way of life illuminated through the efforts of philologists, historians and archaeologists. These specialists continue to sift through diverse literary testimony, unearth further architectural and artifactual details and even probe the depths of the surrounding sea. For a more complete view of the site, visitors can ascend to the nearby summit of Mt Kynthos. Distinguishable from there are virtually all the various precincts and monuments of the island’s once-thriving community. Beyond, set in the blue expanse of the Mediterranean Sea, are neighboring islands both large and small: Rineia to the west, Tinos to the north, Mykonos to the northeast, and Naxos and Paros to the south. In springtime, Delos is awash in yellow, red and purple wildflowers. Low-lying ruins near the residential Hill Quarter become weedy, seasonal ponds where frogs can be heard strangely croaking. Broad-leafed fig trees sprout from rain-filled cisterns, courtyard wells, and the narrow, overgrown banks of the Inopos – an ancient stream that still flows stealthily down from Kynthos. In high summer, Delos radiates with light and heat, intensified by a lack of shade, as hardly a single tree can be found anywhere on the site. Visitors are compelled to seek shelter in slivers of shadow beside house walls or, for the better prepared, beneath umbrellas. Partial reconstructions offer visitors a clue to the former egance and grandeur of Delos’ multi-storied, colonnaded courtyard houses. Excavators have found some evidence of a Bronze-Age Mycenaean presence (ca. 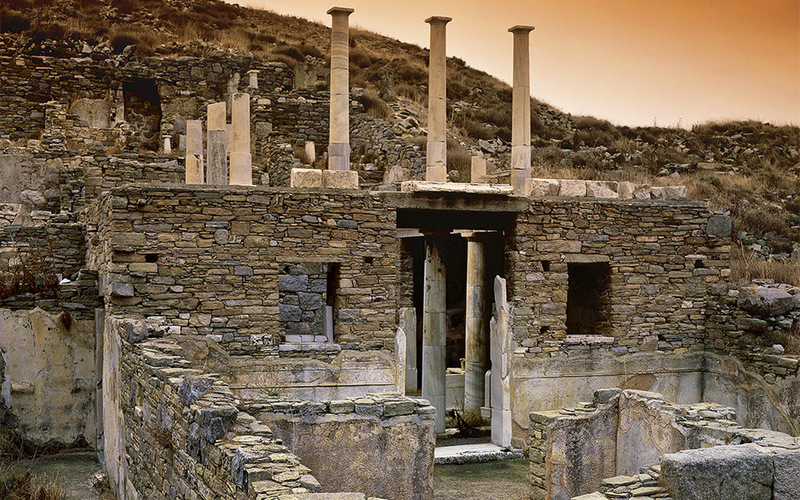 1,600-1,100 BC) in the main harbor area, but the Delos that is best known today began to emerge largely after 800 BC. The island’s sanctuary soon became a widely recognized headquarters of religious authority, second only to the sanctuary of Apollo at Delphi. As Delos’ powerful neighbors – in particular Naxos, Paros and Athens – sought to exert their authority, various monuments or structures were erected as dedications. The Naxians proclaimed their dominance with a now-iconic row of white marble lions (late 7th c. BC) that stand just west of the Sacred Lake. Within the Apollo sanctuary itself, they also installed a colossal statue of Apollo (590-580 BC); an L-shaped colonnade (stoa) that served to define the sacred space (ca. 550-500 BC); and the Oikos of the Naxians (ca. 575 BC), which may constitute either the first temple to Apollo, a ceremonial dining hall or a storage space for cult equipment and votive offerings. The palm tree was especially revered in Delos – brought in on the sea-going ships that connected the island to the outside world. Roman visitors, including the orator/statesman Cicero (1st c. BC), could still see “Leto’s palm” standing beside the Sacred Lake. Nowadays, a symbolic palm tree continues to mark the divine twins’ birth-spot, although the adjacent lake was filled in over a century ago as a preventative measure against malaria. 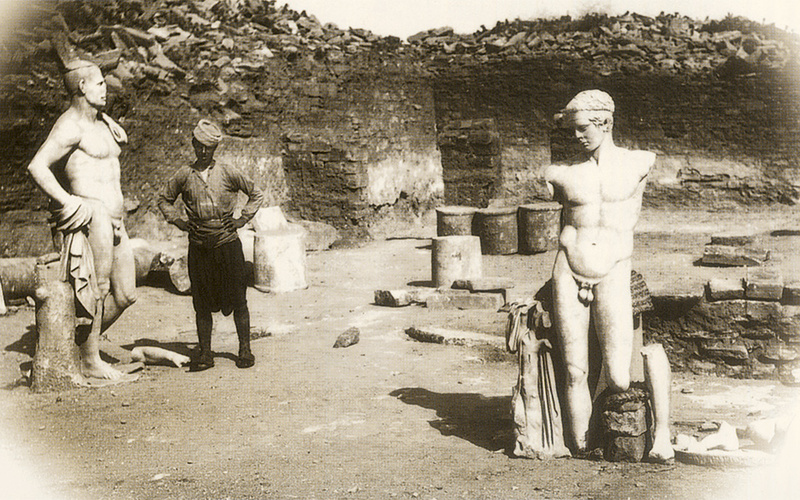 A Mykonian laborer poses between two important Roman (1st c. BC) statues, shortly after their discovery in 1894: the “Pseudo-Athlete of Delos” (left) and the “Diadoumenos” (right, a Roman-era copy of a 5th c. BC bronze by Polyclitus). Both are exhibited at the National Archaeological Museum in Athens (Archives of the French School at Athens). Indicative of these past activities among Delos’ ruins are the foundations of several palaestrae (for wrestling, boxing), a gymnasium (running, other training), a stadium and a theater, all from the 3rd or 2nd c. BC. Of similar date is the Hypostyle Hall (208 BC), northwest of the sanctuary, which may have served as an enormous dining room. A forest of forty-four columns supported the roof over this vast interior space. Near the theater, a gigantic cistern with six internal arches was installed for collection of precious drinking water. Delos’ rise to exceptional economic power and prominence occurred relatively late in its history, sparked by its designation as a free port by the Romans in 167 BC. Prior to this event, Delian prosperity stemmed mainly from cult-related offerings, such as those bestowed by the affluent attendees of festivals. In addition to the Naxians’ lions and colossal Apollo, many other statues on inscribed bases and various votive gifts filled the main sanctuary and lined the approaching Via Sacra. Polykrates, the Samian tyrant, dedicated the entire island of Rineia to Apollo (ca. 530 BC), then confirmed the adjacent islands’ eternal bond by connecting them with a massive iron chain. The Archaeological Museum of Delos is a must-see for visitors, where one finds displayed an array of ancient offerings and personal possessions: elegant statuary, finely painted vases, figurines of gods and goddesses, as well as intriguing household items including wall paintings, mosaic floors, marble tables, and simple cooking equipment. The House of the Dolphins was undoubtedly one of the grandest houses on Delos. Many objects from Delos have been unearthed on adjacent Rineia. During ritual cleansings of the Apollo sanctuary, the contents of prehistoric graves, discarded offerings and other materials were collected and redeposited in sacred pits across the channel. The Athenian tyrant Peisistratus conducted the first such purification ca. 540 BC. After the Persian Wars, Athens took over Delos (478 BC), making it the headquarters of the Delian League, then later, under Pericles, controversially removing the League’s treasury and locking it away on the Athenian Acropolis (454 BC). In 426 BC, Athenian authority was again demonstrated when Delos was further ritually purified and all births and deaths on the island were henceforth prohibited. Today, the Delos Museum displays an array of ancient offerings and everyday objects recovered from Delos and Rineia: elegant statuary; finely painted vases; figurines of male and female deities; wall paintings; colorfully tessellated mosaics; and a range of household items, including marble tables and simple cooking equipment. Athenian hegemony over the Aegean waned in the 4th c. BC, as Macedonian power expanded. By the mid-3rd c. BC, Delos came to enjoy a certain independence under the benevolent eye of Hellenistic kings. During this period, the approach to the sanctuary was enclosed with two colonnades: the South Stoa, built by King Attalos I of Pergamon (post-250 BC), and the Stoa of Philip V of Macedonia (ca. 210 BC). Delos’ pre-Roman population has been estimated at less than 10,000, among which numbered many religious and diplomatic functionaries. Maritime traders would already have been familiar with the island, but commerce was perhaps of lesser importance than its role as a Pan-Hellenic sanctuary and central gathering place, especially for the Ionian peoples of the Aegean islands and western Anatolia. 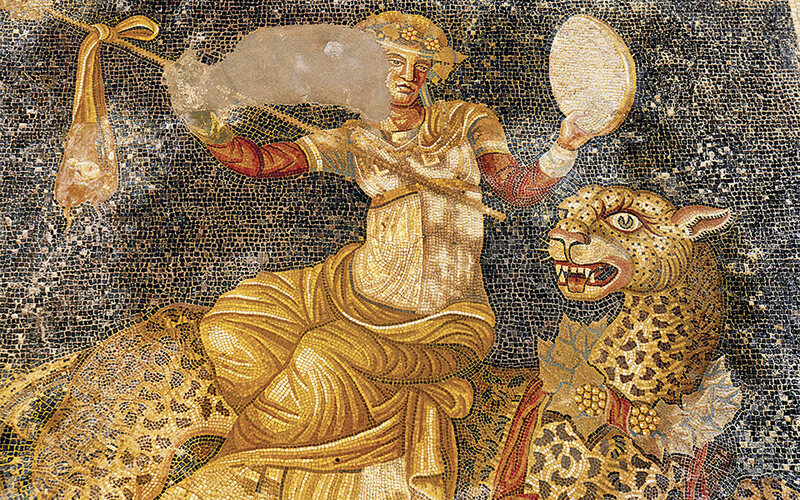 Mosaic floor depicting Dionysus seated on a panther, from the House of the Masks. Delian sovereignty abruptly ended in 167 BC, however, with the rise of Roman imperial power in the region. After backing Rome’s opponent, King Perseus of Macedon, and allowing pirates to use Delian ports for attacks on Roman shipping, Delos was seized by Rome and declared a free port, open to all merchants without concern for taxation. 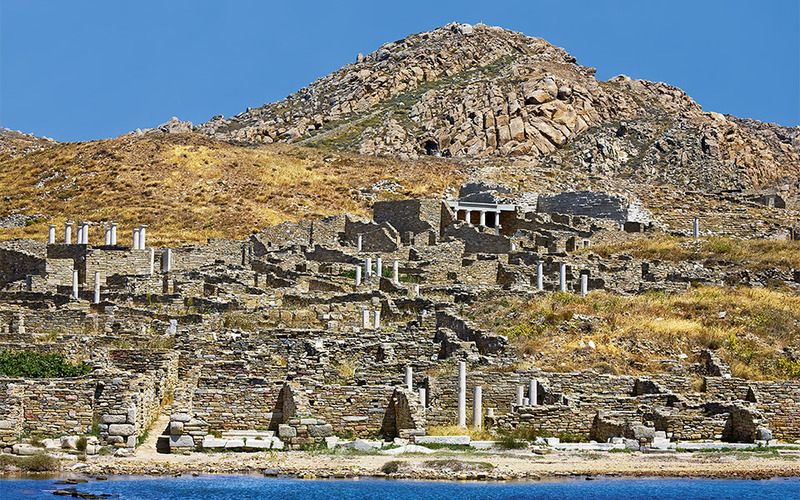 With the Romans striving to quell the maritime power of Rhodes and, not unrelatedly, having destroyed the port city of Corinth in 146 BC, the stage was set for Delos to reach new heights of affluence as a major transshipment center. A new class of wealthy Roman elites sought a vast range of products from the East, many of which passed through Delos, including slaves, grain, perfumes, unguents, bronze and marble statuary, metal wares, culinary specialties, ornate textiles and fabrics and other luxury items. At its peak, Delos would have been truly a splendid sight to behold. In the sanctuary stood three temples and other shrines of Apollo; five treasury buildings to accommodate offerings; the singular Monument of the Bulls that housed a votive trireme; the extensive Stoa of Antigonos; the Ekklesiasterion for the popular assembly; and the Artemision (Temple of Artemis), framed by another L-shaped stoa. Outside the main precinct were shrines dedicated to Leto, Hera, Zeus, Athena, Herakles, Asclepius and the Twelve Olympian Gods. Foreign deities were also given temples, including those of the Syrian gods and of Egyptian Serapis and Isis – the latter’s elegant facade is now partly reconstructed and has become a prominent landmark distinctly visible from a distance. Colonnaded stoas, warehouses and marketplaces were common features of the port area, where the Roman geographer Strabo (early 1st c. AD) claimed the number of slaves traded every day reached as high as 10,000. The multi-ethnic merchants of Delos tended to frequent separate, club-like market halls and cultural/commercial centers, as attested by the Agora of the Delians (4th c. BC, early 2nd c. BC); the Koinon of the Poseidoniasts of Berytos, for merchants and ship owners from Beirut (ca. 110 BC); and the Agora of the Italians (ca. 110 BC). The tall, reconstructed facade of the temple of the Egyptian gods Serapis and Isis stands high on the slope overlooking the ancient town of Delos. Perhaps most evocative of Delian life in late Hellenistic and Roman times are the well-to-do villas and other private houses that offer a sense of the diverse tastes and habits of the people who once resided there. The Delians’ cosmopolitan character and facility with foreign languages were subjects of ancient literary note: “The girls of Delos, hand-maidens of the Far-shooter…sing… of men and women of past days…They can imitate the tongues of all men…; each would say that he himself were singing, so close to truth is their sweet song” (HH3). Delos’ newfound prosperity ended up being short-lived, however, as the island once again picked the wrong side in a conflict (this time Rome), when the Mithridatic Wars broke out between Rome and Pontus. Beginning with a massacre of 20,000 inhabitants by King Mithridates’ forces in 88 BC, the island was subjected to two decades of repeated assaults. From the heights of its former vital role in ancient Greco-Roman life and thinking, Delos became in medieval and early modern times the desolate haunt of crusaders, pirates, and eventually antiquarians. Today, its lanes and squares once more echo with the multi-lingual parlance of visitors hailing from near and far. Is once-revered Delos set for a cultural comeback?